Tesla has yet to deliver a single Model 3 and probably won’t for another 18 months, but the fact that close to 300,000 people already signed up to pre-order the vehicle is already disrupting the industry. During Daimler’s annual shareholders meeting in Berlin on Wednesday, several shareholders have expressed concerns over Silicon Valley-based companies – especially Tesla – leading the electric vehicle market. [A shareholder] warned the automobile industry faced “a radical upheaval, driven by attacks from Silicon Valley”. Among other products, Alphabet is developing a self-driving car. Daimler CEO Dieter Zetsche responded by highlighting Mercedes’ plan to have 10 plug-in hybrid in its vehicle lineup by 2017 and an all-electric car with a range of ~300 miles (500km) by the end of the decade. 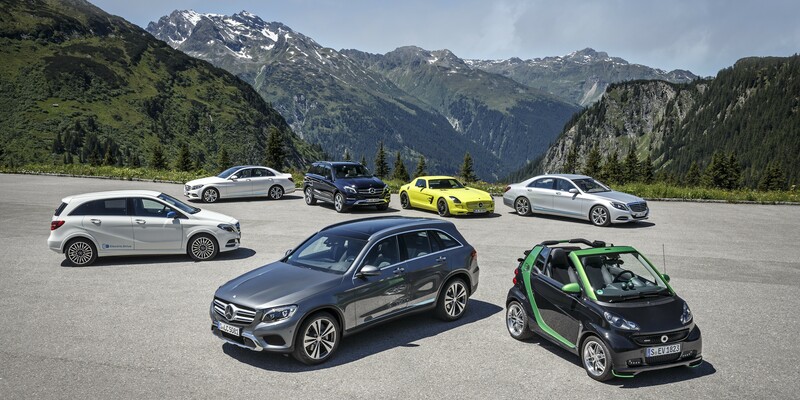 Daimler’s EV vehicle lineup primarily consists of Mercedes’ plug-in hybrid vehicles, but also the all-electric B-Class. Earlier this year, Daimler green-lighted 4 new long-range electric vehicles, which will reportedly be two sedans and two crossover SUVs build on Mercedes’ electric vehicle architecture “EVA”. The first vehicle should hit the market in 2018. The company also recently announced an important €500 million ($543.5 million) investment in a new battery factory in Kamenz, Germany, through its ACCUmotive subsidiary. The battery pack of Mercedes’ only all-electric vehicle, the B-Class, is manufactured by Tesla Motors with battery cells from Panasonic, but the automaker already confirmed it wouldn’t renew Tesla’s supply contract. The partnership between the two companies was also the subject of question by a shareholder during the meeting on Wednesday. In May 2009, Daimler bought a 9% stake in Tesla for $50 million. Tesla CEO Elon Musk once referred to the investment as vital to Tesla staying in business during that difficult financial time. A shareholder asked if the company disposed of its shares in Tesla too early. Daimler sold its remaining shares in October 2014, making ~$780 million in profit. Tesla’s stock is up about 5% since October 2014.